I found these tasty breakfast treats to be on par with any other mainstream apple fritters, particularly ones you'd find in the see-through plastic display cases at donut shops and convenience stores, alongside the bear claws and other pastries. Each time I type the word "donut," I'm torn between spelling it the short and, admittedly, incorrect way—which is now widely accepted, by the way, even in dictionary entries—and the traditional, longer way, which kind of makes sense because it actually has the word "dough" in it. Of course, they haven't much to do with nuts, so the need for the word to make logical sense is not a particularly solid argument for the more traditional spelling, if you ask me. In the end, I usually opt for the shorter version these days, because I am a pragmatist...and perhaps a little lazy. 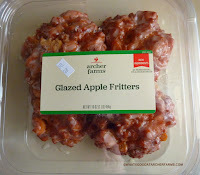 No such problems arise with the word "fritter." 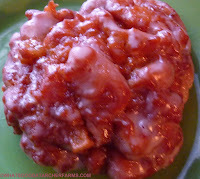 It's fun to say, and it sounds more like a dessert than a "donut" does in my opinion. Plus, there's fruit. Fruit's tasty and good-for-you, right? Right. So, anyway, at least it's a good excuse to go ahead and enjoy these pastries despite their 360 calories and quarter of your daily saturated fat. They're yummy, moderately appley, and soft enough to pass for...well, I won't say "fresh-baked," but will opt for a slightly more vague "packaged in the not-too-distant past." Seriously, they're pretty good. 8 stars is not a bad score from me at all. These fritters are worth 8 out of 10 stars.